The western genre may be moribund, but it refuses to kick the bucket. Singing cowboys, on the other hand, are deader than vaudeville. There was a time, however, when Gene Autry and Roy Rogers were two of the biggest film stars in America. Utah has a predictable plot. Rogers and his singing group, the Sons of the Pioneers, work as ranch hands (along with the crotchety Hayes) on the Bar X Ranch. Meanwhile, Evans and her singing and dancing troupe of ladies are performing in Chicago when they learn their financial backing has fallen through. Fortuitously, Evans’s grandfather bequeathed her a ranch in Utah, which she realizes she can sell to make enough money to keep her show going. Guess which ranch it is? Evans and her distaff posse have to visit Utah to take care of business (natch), and hijinks ensue. Roy and Gabby attempt some elaborate trickery to convince Evans not to sell the ranch, and there are some black hats who want the ranch for themselves. Even in black and white, the Utah landscape is rugged and beautiful, and there are a lot of musical numbers and fistfights to keep the film moving. This isn’t a great movie, but it’s enjoyable, especially if you like singing-cowboy music. By the time he made Utah, Rogers had already starred in more than 40 films. His first lead role was in Under Western Stars (1938), when he replaced Gene Autry, who had walked out on his contract. 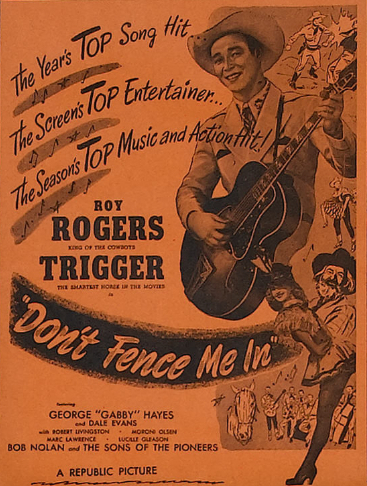 Born Leonard Slye, he rechristened himself “Roy Rogers” for this starring role, and a matinee idol was born. After his first marriage ended in divorce, he married Arline Wilkins. They had three children together, and he was still married to her when he and Evans started making movies together. Wilkins died in November 1946, shortly after the birth of Roy Rogers, Jr., from complications due to a Caesarean section. Rogers and Evans, of course, eventually married, in December 1947. Together they adopted four children, and they remained married until his death in 1998. Posted in 1945, March 1945 and tagged Betty Burbridge, Dale Evans, Donald H. Brown, George "Gabby" Hayes, Gilbert Wright, Jack Townley, John English, John K. Butler, Musicals, Republic Pictures, Roy Rogers, The Sons of the Pioneers, Trigger, Utah, Westerns. Bookmark the permalink.